The Sindh Province has a coastline of approximately 350 kilometers, that comprised of east of Karachi and districts of Badin and Thatta. 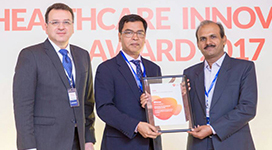 However both, Badin and Thatta are two hazard prone mainly rural districts of Sindh Province of Pakistan, lying between Thar Desert and coastal stretches of Arabian Sea. There are six coastal Talukas in Thatta and two in Badin. A chronology of disasters over the last five decades reveals that both of the aforesaid districts remained in the grip of uninterrupted cycle of disasters in one form or other. Cyclone, heavy rains and floods follow each other with short lived intervals. However, earthquake seems to be rare phenomenon proving to be less disastrous in its effects, in comparison to other hazards experienced by the communities at risk. 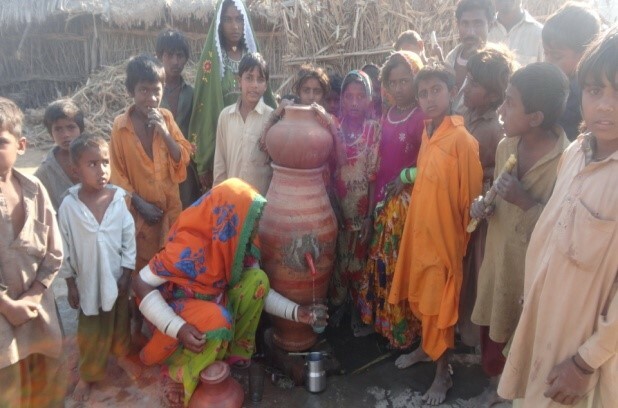 Poverty is widespread throughout both districts, ‘Badin appeared to be the poorest district in Sindh’ . Farming, livestock rearing and fishing are the lifeblood of some 50% rural people living in the coastal districts of Badin and Thatta . However there are some side stream livelihood strategies adopted by local communities, which include woodcutting, beeri making (local method of cigarette making), driving, sewing, stitching, mason work, coal making, individual labour and etc. The communities in costal areas are engaged with their respective occupations (agriculture and fishing) since generations. They term it as their ancestral occupation, which they think is the only secure/way of earning living for them and their families. The communities living in coastal areas are trapped in a complex of vulnerabilities, for instance; the villages situated in close proximity of Arabian Sea are the most frequent subject to the periodical disasters & cyclones. The structure and placement of houses, non availability of disaster resistant physical infrastructures and the remoteness comes into alliance to constitute the physical vulnerability of communities at large. Apart from this, water resources mismanagement at upland multiplied miseries at downstream as districts are situated in the tale end of Indus delta. Therefore land under cultivation has become saline and degraded due to successive floods and sea erosion. A huge irrigation and drainage infrastructures (LBOD and RBOD) have also significantly added into the vulnerabilities of the area and communities living therein. (e.g. floods occurred because of the sudden breach in LBOD, caused huge losses). Unfortunately, 10 million children die in the world every year, where Pakistan ranks 8th in the world with approximately 478,000 numbers of child deaths under 5-years of age every year. The health status of children in Pakistan is below acceptable levels, as infant and under five mortality rates are 77 and 94 respectively (PDHS 2006). Two-thirds of all children under one year die during first 28 days of life. Seasonal pneumonia and diarrheal episodes are the major killers of children under five. Nevertheless a slight progress has been achieved in the last 10 years in infant and under five year mortality. Over all education and health related picture of women and children in the rural coastal areas is bleak, as there are largely neglected aspects of the life. Traditionally women get no preference in health, education, food and clothing. The analysis of the reports reveals that the male literacy ratio is about three times higher as compared to females , but sharp differences exist in the literacy ratios by area (rural and urban). The basic health needs of women and children are not being adequately met. Thatta and Badin have only 9&7 Mother and Child related Health Center respectively. Infections, malnutrition and the complications of the pregnancy and childhood continue to take heavy toll of life. Child mortality rates are 4 in 10 under the age of 2 years in some places. There are almost no adequate health services available to mitigate this situation. 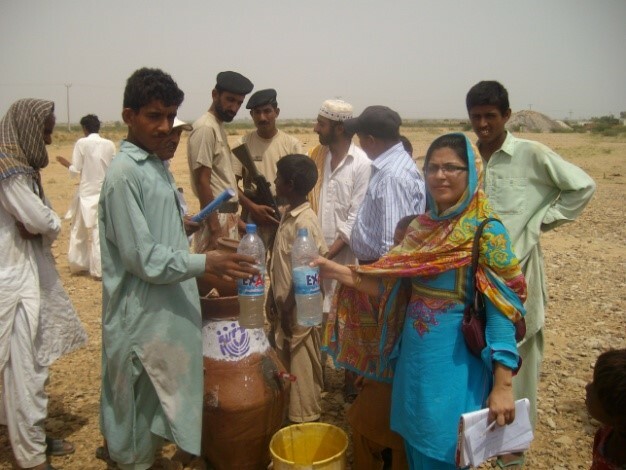 According to Sindh Bureau of Statistics that unsanitary condition, polluted water, illiteracy among rural mother, high fertility, small budgetary allocation and inadequate administrative structures have been identified as the main hurdles in the progress of health conditions. There are also clear differentials in health conditions by rural and urban areas and socio-economic groups. Majority of the diseases in the areas are caused by malnutrition and the use of unsafe water. Safe water supply for human, animal and crop consumption is the critical issue for the coastal communities. It also effects on their ability to own live stock, especially in the areas where there are severe problems of drinking water and fodder availability. Every documented beneficiary needs assessment mentions water supply as a major issue and most place a supply of drinking water as the first requirement for any project to tackle . Lack of water impacts on the productive use of human time (women can spend all day fetching and carrying water), on health (dirty water means that a high proportion of the population, especially children, suffers from water-borne disease), the distribution of the population (often along irrigation canals and drainage ditches) and the choice and productivity of crops. It can be fairly said that the failure of the water supply is the single most important constraint to any development in the coastal district. 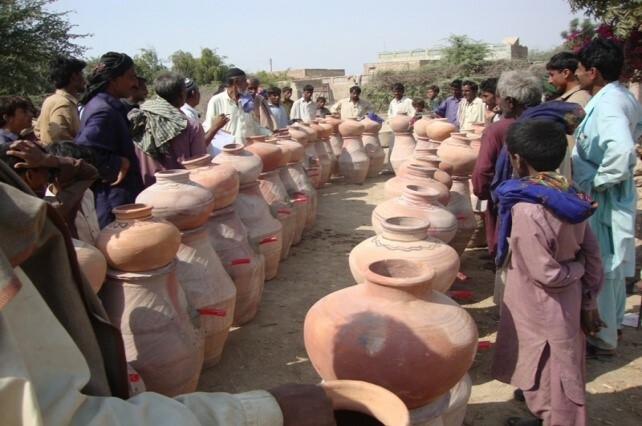 Though there are various types of water sources available in coastal areas for drinking and domestics purposes, but majority of them are severely constrained in many ways. For instance, piped water supply mainly available for urban localities or near urban areas, remote and rural areas still deprived from this facility. Canal water is usually uncertain, irregular and polluted. Ground water, ponds and wells have become saline, due to continuous environmental degradation and water mismanagement since long. Therefore, the need for improved water is urgent but more importantly, it should be cost effective, simple and according to local conditions so that the poorest people of the region may efficiently own it. Association for Humanitarian Development (AHD) is a nongovernmental organization established in December 2001, with the major objective to work for peace, justice, harmony, and equality through participation of the most disadvantaged and marginalized communities for the sustainability. AHD has initiated several livelihood and development programs by targeting rural women. The major accomplishment in this regard, is the introduction of Bio-Sand Water Filter(BSF) / Nadi Filter in hundreds of vulnerable villages in coastal areas (Jati & Sujawal) to improve access of poorest communities to safe drinking water. 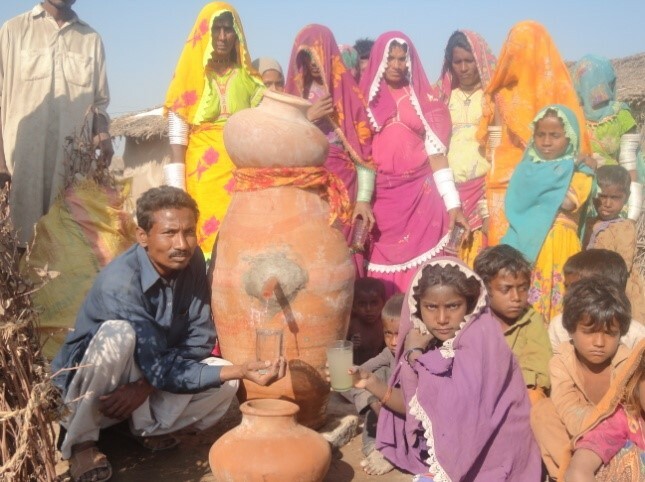 AHD’s BSF Project is known as Nadi Filter (local name), because Nadi (a mud pot, 32-34 inches tall) is commonly used by local community in household for water storage purposes. Nadi filters are financed by Misereor Germany, UNEP-APFED, ADP & Oxfam GB. Under the project AHD has installed more than 23,500 Nadi filters during the past 06 years 2006-2014, providing life-sustaining water to more than 141,000 people, who are living in rural communities. Further AHD working to install more 6,000 Nadi filter water units in 2014-2015 with CDP Department Govt. 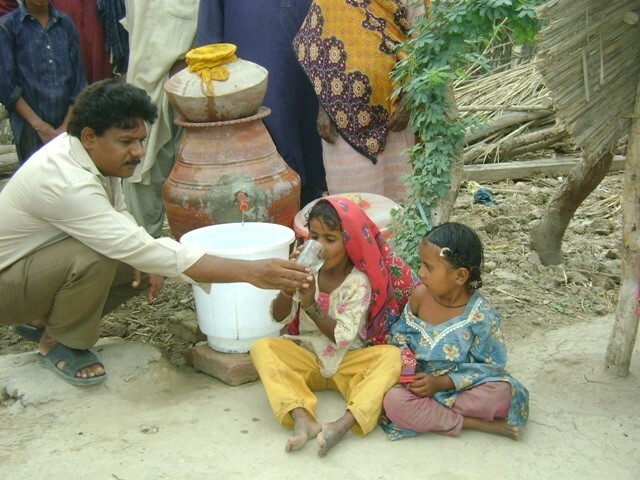 of Sindh and Global Giving, AHD will be successful at the end of 2015 total achievement of 30,000 Nadi filter units promotion or installation by poor communities with provision of safe and clean drinking water for more than 200,000 women, children and old people. Bio-Sand Water Filters (BSF) are a technological adaptation of the centuries old slow sand filtration process. It is not a newly developed technology, several commercial and community-scale implementations exist in different countries. The largest use of BSF technology has been in the humanitarian arena. 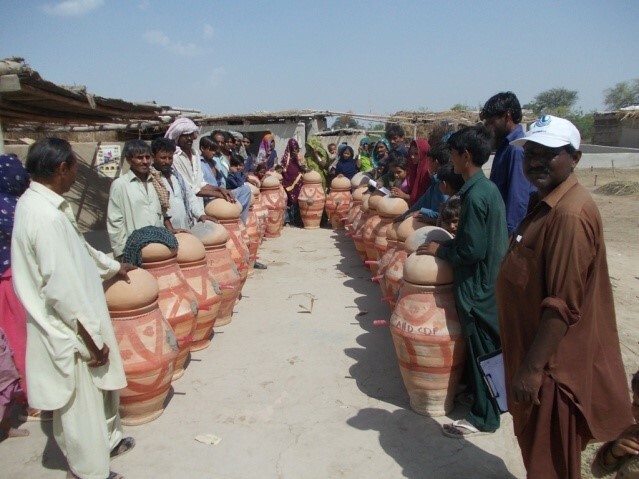 But in coastal areas of Sindh, it is first time to take such initiative at household level by AHD. Technology and method exist to bring improved water and sanitation practices to even the most remote areas. It’s an affordable, sustainable household technology, proven to be very effective in improving the quality of water to make it safe for drinking, cooking, bathing, and cleaning. The average cost of a Nadi filter, which normally serves a household of 8-10 people is only Rs 1,000-1,500/=. That includes the cost of material, installation, transportation, the cost of training on the filter operation/maintenance and important health and hygiene education. BioSand Filters remove 95.0 to 99.0% of organic contaminants, including bacteria, viruses, protozoa, worms, and particles. Safe water produced by the filters is free of discoloration, odor, and unpleasant taste. The most common home-based models can produce between 5 to 10 liters of water per hour but Nadi filter can produce 30 to 40 liters of water per hour. How does Nadi Filter Work? The Nadi Filter is an adaptation of the natural process of slow sand filtration. Different sizes of gravel and sand are layered inside the filter/Nadi, with a PVC collection pipe situated at the base of the filter. Contaminated water from rain, surface, or ground sources is poured through the Mutka (a mud pot, smaller in size and different in shape than Nadi) , placed at the top of the filter having small hole at the bottom. The filtered water flows out of the pipe and is collected in a safe storage container to prevent post-treatment contamination. The top few centimeters of the sand trap the bulk of micro-organisms, which accumulate and develop into a highly active food chain, called the Biological Layer. The biological layer, which must remain partially wet, traps and feeds on the micro-organisms and contaminants in the water. Further filtration occurs in the lower layers of sand and gravels, which removes contaminants that cause odour, cloudiness, and taste. Together, the organisms in this layer comprise an intensely active, complex food chain – digesting organic matter and disease-causing parasites, bacteria and viruses, including eliminate 100% of worms, parasites, and particulate matter. This dramatically reduces the incidence of infection and disease from contaminated water. As the filter is used, the biological layer matures and thickens, causing the flow of water through the filter to slow. Recipients of filters are trained to watch for decreased flow and can renew the filter simply by skimming off any debris from the top of the sand, and by gently stirring the sand to break-up the biological layer. The quality of source water will determine how often this process is necessary. AHD has trained 400 villagers form 32 villages in this regard. Nadi Filter can last for many years with only basic maintenance by its owners. They are developed on-site from local materials, and have no electrical or mechanical parts to wear out. The combination of factors makes the Nadi Filter an extremely sustainable solution that is well-suited for remote areas. AHD has also established its own laboratory with major support provided by OXFAM to test the water purification level once filter is installed at household level. AHD has developed immense organizational potential and expertise and now extending its services to other NGOs which are interested to introduce the same. The benefits to quality of life provided by the filters are substantial. The filters improve the health of families especially women and children showed greater satisfaction on installation of filters in their houses. It enables them to escape the vicious cycle of poverty that hampers economic and social development for individuals, communities and entire nations. During field visit to several villages ______, _______ following was shared by women beneficiaries. "Life has changed especially for us because of the water filter," she further adds that "we don't have to walk anymore to find safe water or to buy it. We have felt the change in the water we now drink. We cannot simply drink the water from the canal/hand pump if we don't filter it, because it hurts our stomachs and makes us vomit, and it even makes me dizzy. This is where we’ve been able to prove that the filters really do work. We accept that Nadi filters are a blessing from God that has come to us here." Apart from this it also increases the poor people's access to safe drinking water would resulting in major economic and social benefits. Studies have shown that the filter can reduce diarrheal illnesses by up to 40% including skin diseases, which has a tremendous impact on the overall health and productivity of a family and entire communities. A woman reflected that "The canal water is very contaminated," she confirms, noting she and her family used to be plagued by diarrhea, dysentery, and skin problems. "We had to spend a lot of money on medicines." Work productivity and school attendance increase due to fewer sick days, and improved health means families are able to spend less of their meager incomes on medicines, improving their overall quality of life. The environmental outlook of communities is improved especially, where the filters are used and trainings provided by project staff related to health and hygiene. Some Nadi filters are maintained by men as well, this challenges gendered division of labour within household, where managing water is solely a women’s responsibility. Nadi Filter has great potential to be introduced in other remote areas. 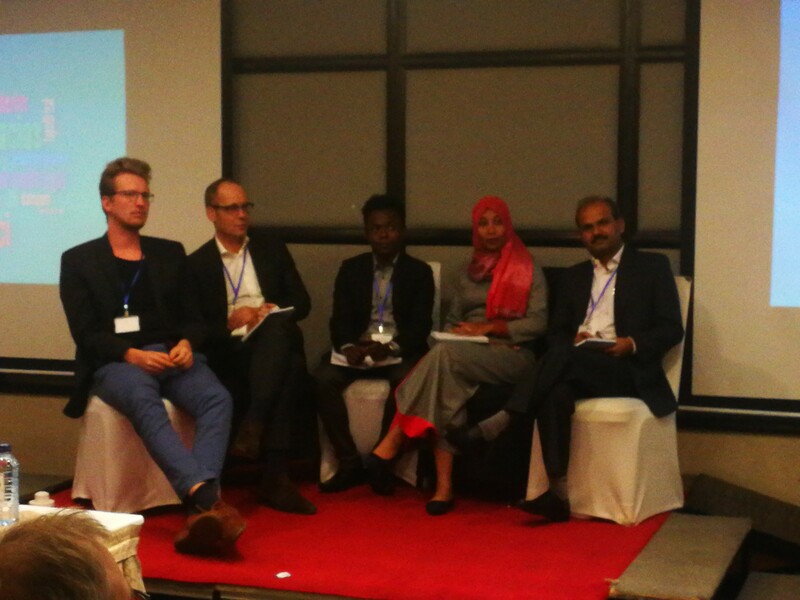 But its scale up requires collaboration in local, multi-national, national and international organizations. Experience shows once communities are use to of drinking filtered water, avoid consuming contaminated water anymore. Due to use of mud pots water remain cool even in extremely hot weather conditions. If it is placed in appropriate place/under shadow, away from direct sun light. It has multiple advantages 1; reduces diarrhea stomach aches, skin infections, urinary tract, infections, waterborne disease, 2; removes turbidity color and ordour from water, 3. requires minimal maintenance and 4. constructed from local material. But following limitations may not ignored. 6. Documentation such as publications, newspaper articles, photos, videos, DVDs, brochures, website, etc. AHD was promoting an innovative, sustainable and cost effective technology of Bio-sand Nadi Filter units for safe drinking water to the project beneficiaries at their household level. The Bio-Sand Nadi filter is adoptable technology and easily transferable in the rural poor communities. The material is locally available and easy to arrange in any village of Target UC. There is no need of the big maintenance for Nadi filter unit but when the Nadi filter water come slow than there is need to put 2-3 inches upper sand out and wash it with water till the sand will washed cleanly and again put it in Nadi the filter will be ready to use further this process can be repeated after 2 months with no any expenses and the Nadi life is about 5 years or more depend on the care. 9. Replication potential of the project: can it be implemented everywhere? AHD will develop and distribute IEC material for the preparation and effective usage of the Bio-Sand Nadi Filter, the majority of IEC materials will be visual consisting of posters, pamphlets, stickers, in order to reach the majority of the target population that is illiterate. In addition, brochures will be provided in the Local language to TOT participants, NGOs and CBOs. 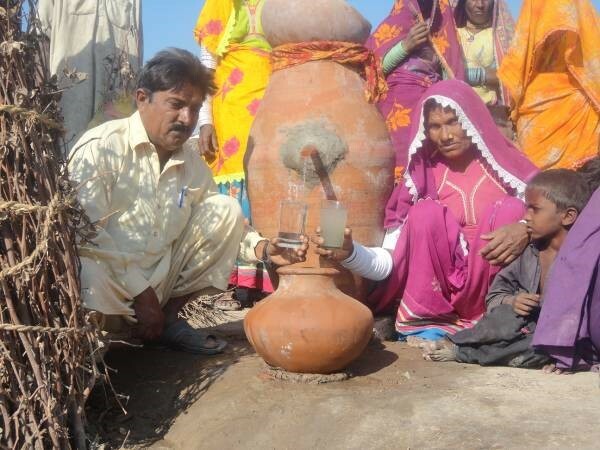 Targeted families are able get clean and safe drinking water from their household level Nadi filter and they are saving their children and women from the dangerous water borne diseases. The project is sustainable in its nature and once targeted families learn the safe and safe health activities that will benefit them throughout their live. The said project is ensuring women/men participation, contribution and Hygiene Promotion activities at house hold level. Sanitation practices observed in the affected communities were poor. Another issue was Solid Waste and lack of drainage facility in the locality; Most of the communities were stayed near to water. The alarming situation for drainage and solid waste increase breeding ,of different kind of viral infection and disease which was very harmful besides residing community.